How Important Is An Ad’s Position? Do we need to choose a target position for our Google keyword set? Hal Varian, Chief Economist at Google doesn’t think so. Low adoption? Really? Well, only Google would know and can decide that. There were a lot of advertisers who liked it and were using it. However, as Mr. Varian mentions, there are alternatives. Some 3rd party search management platforms offer a “bid to position” option. The key question is: How important is an ad’s position? At the beginning of my search-marketing career, I was led to believe that it’s all about the position. When I first started working Search Marketing, the top spot was considered to be the sweetest position. 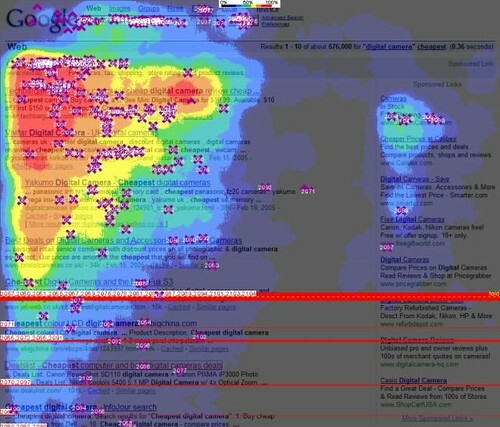 Heat-map studies confirmed this theory, which is consistent with eye-tracking, people start at top left and work down. Also, research suggests that advertisers appearing at higher positions are viewed more favourably by consumers, as a certain repute and legitimacy is associated with premium advertising spots. As the market matured and the competition increased, chasing that ever elusive top spot was no longer commercially viable. Advertisers started to test their ads in other positions. Devising position strategies became the holy grail of the new age SEM. Whilst only the top position would do for Brand terms, finding a new sweet spot for the core generic terms became essential. Now, the latest blog post from Hal Varian suggests that we’ve been wasting our time. According to Hal, position targeting is overrated. Average position is not a true representation of the actual position your ads appeared on. This is particularly true for extended match types, wherein a variation of the search term could appear on position 12 whilst the other could be served at position 2; giving us an average position of 7, which is highly inaccurate. Even on exact match, due to the dynamic nature of the auction, the same ad, with the same bid, could appear on various positions throughout the day. Again, the average position fails to give us the true picture. Furthermore, a higher average position doesn’t necessarily translate into more clicks and conversions. A high traffic, highly competitive term, on a lower position would generate more qualified traffic than the less popular, longer tail term at position 1. Back to square one: Does position matter? Brand Terms: All advertisers would/should occupy the top spot for their core Brand and Brand Generic terms. Key (strategic) Generic terms: If you business is targeting a particular niche demographic/market, certain generic terms would deserve a “brand term” like treatment. For example, if your business specializes in offering car insurance to over 50’s, then “Over 50s car insurance” is that strategic generic term for you. The above, combined with the overall campaign objective, would define the position strategy. So if the overall objective is “Brand Awareness” then higher positions could be crucial. On the other hand if the campaign needs to be more CPA focused, then each keyword should be treated purely on its merit. Merit being clicks and conversions and not necessarily average position. Go to the Keyword tab of the campaign. In the Automatic action section, select Raise bid and enter “x%” (e.g. 10%).You can also enter a maximum bid if you want (your bid won’t exceed the maximum). Add a requirement that the average position must be worse than “y” (e.g. 4). Then, specify that the rule should be performed every day at 12pm using data from the previous day. Enter a name for your rule. Choose whether you’d like to keep track of changes by receiving an email each time the rule runs. Click Preview for keywords below to preview your rule and then click Save.